Old map by SCOTT -A Map of the Discoveries made by Capt. Cook & Clerke in the Years 1778 & 1779 between the Eastern Coast of Asia and the Western Coast of North America. . . Title: A Map of the Discoveries made by Capt. Cook & Clerke in the Years 1778 & 1779 between the Eastern Coast of Asia and the Western Coast of North America. . . Size: 7.5 x 11.0 inches. Condition: In good / fair condition, multiple creases have been flattened out, some paper thinning. Good margins. 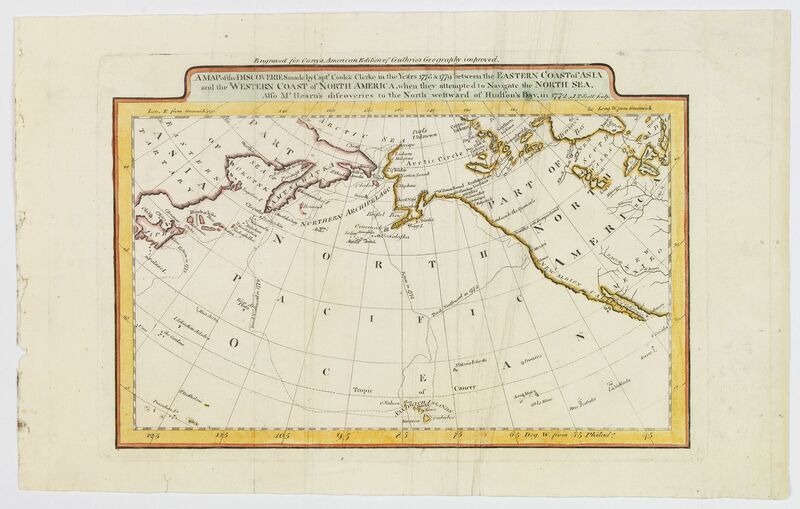 An early American map showing Cook's explorations of Hawaii and Alaska, published in one of the first atlas of America printed in America. "Engraved for Cary's American Edition of Guthrie's Geography improved." Cary re-engraved a British map of 1784, and added changes reflecting American patriotism. Longitude is measured west from Philadelphia. Carey's edition of Guthrie's Geography was published the same year as his "American Atlas", the 1st atlas published in the United States. The chart centers on the Pacific Northwest Coast from the Gulf of California (the Baja Peninsula) to the Alaska Coast, Prince William Sound, Cook's River, the Bering Strait, the Aleutian Islands and Russian Kamtschatka. The tracks of Capt. Cook in his ship “The Resolution” and Capt. Clerke in “The Discovery” are shown crossing the Pacific from Hawaii to the NW Coast & Kamtschatka. Capt. Clerke took over as Master of “The Resolution” after Cook's death in Hawaii in 1779. Samuel Hearne's discoveries to the north of Hudson's Bay are depicted, as well as the area where he located the Coppermine River in 1770. Hearne was the first white man to to cross overland from Hudson's Bay tracing the river to the Arctic Ocean. Reference: Antipodean Books, Maps & Prints E List 6..